The world saw Stevenson's novel "Treasure Island" over one hundred and fifty years ago. The novel was illustrated by the picture of island map. 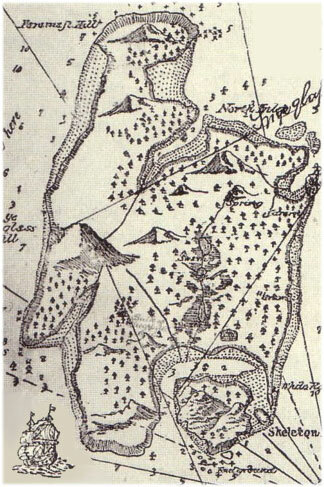 This map is considered to be drawn by the novel's author himself. Suddenly an idea appeared - for collection of coordinate position on satellite map to find an island similar to "treasure island" and at the same time to determine whether the map is invented or the prototype of small piece of land in the ocean really exists. By means of Google maps we set out in search of the island by shape similar to "treasure island" drawn on Stevenson's map. The novel describes the island located somewhere in the ocean by appearance reminding dinosaur its hind paws standing on the stone as we see it on the old map. After long term searching and investigating hundreds of islands on the satellite map we find out that it is impossible to find an isolated real island even vaguely resembling "treasure island" by shape. Are researches were null and void. We did not find prototype of "Treasure Island" on Google map. Information. The islands are always mostly located above the Ocean level. But due to Earth crust movement some of them are drowned into the ocean. And vice versa, new land plots appear in the ocean. Thousands of islands are located in the oceans, seas and big lakes of our planet. Nobody knows their exact number. To count them by Google map is also impossible. Some islands are populated but a large number of them are desert islands. By Google map one could identify a desert island - there are nor buildings and roads on it, and if the island is populated then the airports, roads and sometimes even houses are observed on the map from satellite.